For savvy investors who already know and understand real estate investing—and might be doing so outside of their existing IRA—using funds in a self-directed retirement plan to buy real estate has a number of positive financial and tax benefits. As with all alternative assets allowed through self-direction, real estate is a great way to diversify your retirement portfolio and go beyond the traditional stocks, bonds, and mutual funds. You can also generate tax-deferred (Traditional IRA) or tax-free (Roth IRA) income or gains with real estate investments. 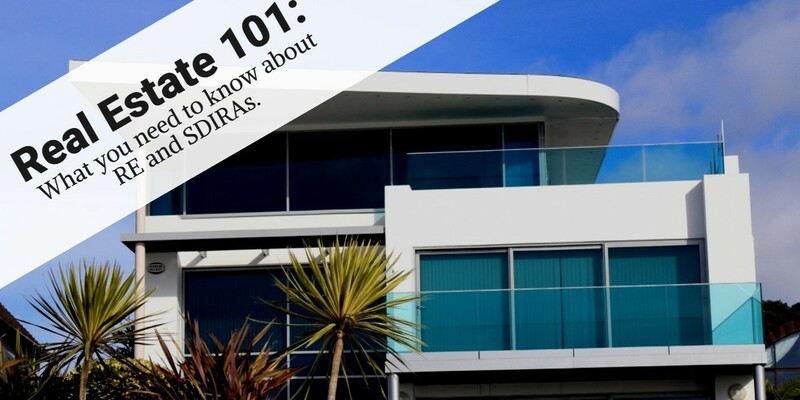 When your self-directed Traditional IRA purchases real estate, all gains are tax deferred until a distribution is made or, if your Roth IRA made the investment, the gains are tax free (after-tax). Using personal funds to purchase property is a different tax scenario, leading to gains that are subject to federal income tax and very often, state income tax as well. As with all investments made through self-directed accounts, all income and expenses associated with the asset must flow through the retirement account. Expenses include repairs and maintenance, real estate taxes, and other costs related to the property. No personal funds may be used so investors are wise to make sure their self-directed retirement plan is funded amply to take care of these expenses. Rental income on investment property is paid to the self-directed IRA. Be sure to keep good records of all income and expenses generated by real estate investment that is owned by your self-directed retirement account (your account administrator and your accountant will be pleased!). In accordance with Internal Revenue Code Section 4975, the retirement account holder cannot make an investment that will directly or indirectly benefit oneself or any disqualified person. Nor can the account holder perform any service in connection with the investment, guarantee any retirement account loan, extend any credit to or from the retirement account, or enter into any transaction with the retirement account that would present a conflict of interest. Should your real estate transaction require financing, only a non-recourse loan should be used. A non-recourse loan is one that is not personally guaranteed by the retirement account holder or any disqualified person; that way, and whereby the lender’s only recourse is against the property (thereby protecting the borrower). Note that when using a non-recourse loan to purchase real estate with a self-directed IRA, you may trigger unrelated business income tax (UBIT). We always strongly recommend that our clients discuss these transactions in full with their trusted tax professional to make sure they are going into the purchase with full visibility and having conducted due diligence. No one likes nasty surprises! Note that if you owe UBIT tax, IRS Form 990-T must be filed. As a third-party administrator of self-directed retirement accounts, Next Generation Trust Services carefully reviews all of our clients’ transactions before executing the instructions in order to determine the feasibility of holding the asset and to try to ensure no prohibited transaction is taking place.We can answer your questions about what constitutes a disqualified person or what kinds of activity could trigger the IRS prohibited transaction rules. Our informative video series includes one on how to fill out a real estate starter kit properly (used to open a self-directed IRA at Next Generation, for the purpose of purchasing investment property with a self-directed retirement account) as well as how to avoid making a prohibited transaction (and details on who those disqualified individuals are—including the account holder). We also have some encore webinar presentations on the topic of self-direction and real estate investing; we encourage you to watch these as well. At Next Generation Trust Services, our team of experts manages all the paperwork related to the account and expedites the transactions on behalf of our clients after a thorough administrative review. We also handle all the mandatory reporting related to these accounts. For more information, please do not hesitate to contact us at Info@NextGenerationTrust.com or 888.857.8058 and get started today!